Ethos (trust) — first you need to establish that you are a trustworthy person. (Click here for more). Logos (logic) — once you’re perceived as trustworthy (and only then), you can deliver the logic of your argument. (Click here). Pathos (emotion) — to sum up, you need to touch on the audience’s emotions. Why is your recommendation good for them? (Click here). I’ve always wondered, how do you quickly establish that you’re a trustworthy person? It’s not easy to project trustworthiness to an audience. Credibility is certainly a key ingredient — but that just begs the question, how do you project credibility? Then I re-read Jay Conger’s article (click here) and discovered that credibility comes from two sources: experience and relationships. I intuitively understood the experience part. Whenever I speak to an audience, I briefly introduce the relevant details of my experience. I try not to overdo it as I don’t want to come across as arrogant or academic. I find that a little self-deprecation can help. This is typically a variant on, “I know a lot about the topic because I’ve made a lot of mistakes….” Ultimately, however, I want the audience to know that I have been successful. To do this, I often find it helpful to have someone else introduce me. They can brag about me in ways that I can’t. Conger points out that credibility also includes open-mindedness. Persuasive people are often perceived as good listeners as well as good speakers. They can incorporate what their audience has to say and adjust their positions. This is the relationship aspect of credibility. People who are honest, even-keeled, and who “generously share credit” are perceived as more credible and trustworthy. But what if your audience doesn’t know that you are honest, even-keeled, and appreciative? What if you’re speaking to the audience for the first time? I find it’s very useful to interview members of the audience before I give a presentation. Then I can discuss my experiences and what I’ve learned. I’m more credible simply because I listened before speaking. I also like to speak to the audience’s customers before a presentation. Because I’m an outsider, I can ask “dumb” questions of customers. This often produces interesting, even unique, insights that I can pass on to the audience. That demonstrates that I’m open to interesting sources of information and that I have some interesting perspectives to share. That makes me more credible and more persuasive. Before you approach an audience, think about how you’ll build your credibility and trustworthiness. 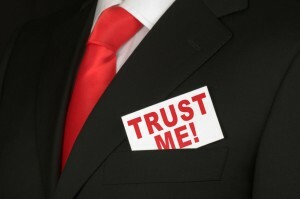 If you establish that you’re trustworthy early in the presentation, you may well succeed. If you can’t establish your credibility, the rest of your presentation is just wasted time. One Response to Where Does Credibility Come From? Great advice for establishing credibility. The other benefit of meeting with audience members beforehand is that it gives you a chance to tweak the context of your messages. A little tweak here and there can make the difference between a response of “this would be great for me/my company”, and “this might be good for somebody else”.